Here you will find a list of add-ins that extend the functionality of Outlook online and Outlook Web App on iPad. If you use Outlook online often, you will appreciate these handy assistants in your browser. 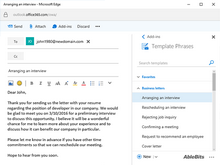 Compose typical email responses in under a minute with a set of ready replies at hand. Get some standard phrases with the add-in, add your favorite replies as templates and deal with emails like a pro. The add-in offers many time-saving features, from organizing responses in groups to macros that let you add recipients to particular answers, replace certain words to customize the reply, and more. Just one click in your email conversation will let you see all files ever sent here. Open any specific email with attachments by clicking on the file name within the add-in. Use the search field to find any file, filter out senders, or sort by date.